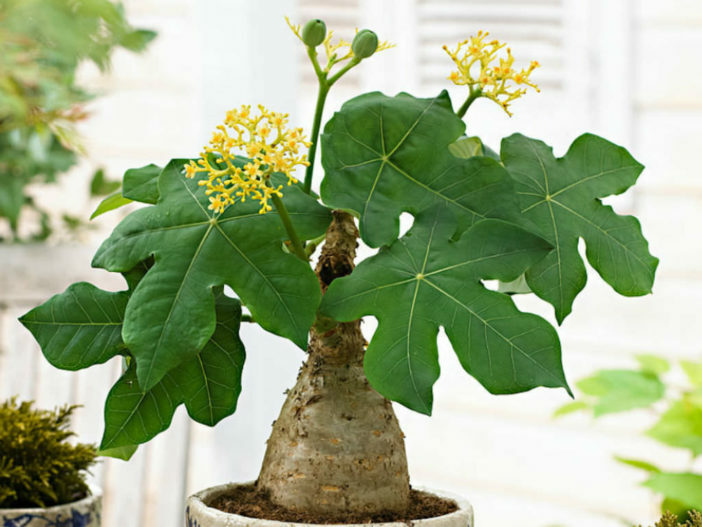 Jatropha podagrica ‘Yellow Flowers’ is a tropical, frost-sensitive, succulent shrub up to 8 feet (2.4 m) tall. It is an outstanding cultivar distinguished from Jatropha podagrica by its bright yellow flowers, instead of bright red. All the other characteristics clearly show that they are conspecific, namely size and form of stems, leaves, flowers, fruits and seeds. Jatropha podagrica ‘Yellow Flowers’ is a cultivar of Jatropha podagrica.